Jack Hokikian on "Between the Lines"
In 2005, Jack Hokikian discussed The Science of Disorder on KLCS-TV, The Education Station, with Barry Kibrick, Producer/Host of "Between the Lines" (www.barrykibrick.com). KLCS-TV, Los Angeles, is a member of PBS. Its coverage extends from Santa Barbara to San Diego. The interview also aired in Northern California on KRCB-TV, in Chicago on WYCC-TV, in New Orleans on WLAE-TV, and on LA Channel 36 (www.la36.org). Barry Kibrick started the 21st year of Between the Lines with great impetus. The show is now in Hi-Def, a new studio, graphics, music and artwork, generating a more intimate feeling and stimulating environment. 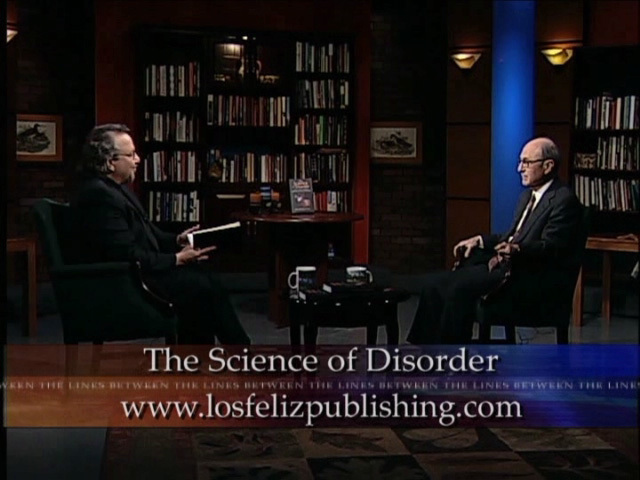 In April, 2018, Jack Hokikian discussed with Barry Kibrick topics from The Science of Disorder and also from the Essay in this Website: Need to Know the Second Law. Section VI: Effect of Technology on Human Attention Span got some attention.